His second given name "Ronaldo" was chosen by his father after than USA President "Ronald Reagan". Cristiano Ronaldo is perhaps one of the best soccer players or footballers of 20th century. He is commonly known as Ronaldo and wears number 7 for his current club Real Madrid. Cristiano Ronaldo biography is very rich with many different success stories playing for different clubs throughout his soccer career. Cocky with his playing skills, Ronaldo has every right to show off as he is one of the most dangerous players when it comes to taking defenders one on one and finishing with the ball in the back of the net. Ronaldo is known for his bicycle dribble where he leaves the opponent looking at the ball confused at Ronaldo's next move as well as for his deadly shot from distance, up close or from a free kick. 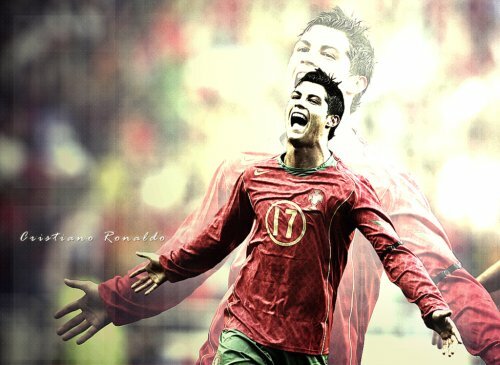 Ronaldo is very much a complete soccer player that has speed, build and vision. His transfer to Real Madrid should be mentioned in this Cristiano Ronaldo Biography because of a fact that it was the record soccer player transfer worth £80 million (€94m, US$132m). He also makes £11 million per year over the next six years, making him highest-paid soccer/football player in the world. Cristiano Ronaldo profile also shows that he is currently valued at €1 billion per his buyout clause. Cristiano Ronaldo biography shows him starting his youth playing days at Andorinha for 2 years, than moving to Nacional for another 2 years before being spotted by the Portuguese giants Sporting CP where he spent the next four years (1997 - 2001). Cristiano Ronaldo is the only player to play for Sporting CP's under-16, under-17, under-18, B-team, and the first team, all within one season. Important to mention in this Cristiano Ronaldo Soccer Biography is that during his time at Sporting CP Ronaldo was also diagnosed with a Racing Heart condition which could have ended his career when he was only 15 years old. At 15 Ronaldo's mother had to give authorization for Ronaldo to have a surgery on his heart where laser was used to cauterize the area of his heart that was causing the problem. Shortly after the operation Ronaldo resumed the training with the team. Cristiano Ronaldo Biography shows that he was almost brought into the Manchester United rival Liverpool. He was first spotted by than Liverpool manager Gerard Houlier when he was 16 but Liverpool declined to sign him because he was too young. Only two years later he was spotted by Manchester United manager Sir Alex Ferguson who immediately signed the rising star making Manchester United a large part in Cristiano Ronaldo Biography. Cristiano Ronaldo profile shows him being the very first Portuguese player to ever play for Manchester United. He was brought to the club for a transfer fee of €15 million (£12.24 million) in 2003. One thing important to mention in this Cristiano Ronaldo biography is the fact that Ronaldo wanted to wear number 28, like the one he wore for Sporting. This was because he did not want to have the pressure of wearing number 7, worn previously by legends George Best, Bryan Robson, Eric Cantona, and David Beckham. Cristiano Ronaldo said "After I joined, the manager asked me what number I'd like. I said 28. But Ferguson said 'No, you're going to have Number 7' and the famous shirt was an extra source of motivation. I was forced to live up to such an honour." His first three years at the club were spent scoring goals and winning fans all around the world. First year with the club he helped Man U win the FA Cup Trophy where he also scored a goal in the final against Millwall. Ronaldo won his second trophy with United during the 2005/06 season by helping Manchester win the League Cup. 2006/07 season marks the breakout year in Cristiano Ronaldo biography and career. It was this season that he broke his barrier of 20 goals in a single season and also helped Manchester United win the league title for the first time in the past 4 years. Ronaldo was also voted Barcleys Player of the Month consecutively in November and December making him only the 3th player to do so after Robbie Fowler in 1996 and Dennis Bergkamp in 1997. There were rumors of Real Madrid wanting to spend €80 million (£54 million) on the rising star in 2007 but those rumors were shut down when Ronaldo signed a new 5 year contract collecting obscene £120,000 weekly making him the highest paid Manchester United player in the history of this great club. The next 5 years of Cristiano Ronaldo Biography at Manchester United marked success after success and trophy after trophy for the young player. He even won the Ballon d'Or in 2008 being the first United player to win such an honor since George Best did it in 1968. In 2009 Cristiano Ronaldo Soccer Biography continues with winning the FIFA World Player of the Year, making him the very first player to do so in the history of Premier League. He was also only the 2nd player to do so for Portugal, after Luis Figo did it in 2001. In 2009 Cristiano Ronaldo Soccer Biography continues at Real Madrid after Manchester United received and accepted the offer of £80 million from the Spanish giants. Ronaldo scored a total of 84 goals in 196 appearances for Manchester United. Before leaving the club, Ronaldo expressed his gratitude towards the Manchester United Coach Sir Alex Ferguson saying "He's been my father in sport, one of the most important factors and most influential in my career." Cristiano Ronaldo Biography continues at Real Madrid on June 26th 2009 when Real confirmed the signing of Ronaldo from Manchester United for £80 million. Ronaldo was to be paid €11 million per year over the next 6 years with a €1 billion buy-out clause in his contract. He was presented to the fans of Real Madrid on July 6th where he was handed the #9 shirt, after the Brazilian Ronaldo had left the club. He was welcomed by record 80,000 fans at the Santiago Bernabéu Stadium, surpassing Diego Maradona's record of 75,000 fans when he was presented in Italy, after he was transferred from Barcelona to Napoli in 1984. Ronaldo broke another record right after arriving to Real Madrid as he became the first Real Madrid player to score a goal in each of his 4 La Liga appearances. Ronaldo teamed up with Gonzalo Higuain to score 53 league goals during the season and became the highest scoring duo in the history of Real Madrid. After Raul left Real Madrid in 2010, Ronaldo was handed the #7 jersey for Real Madrid. Ronaldo began the 2011 with a very promising outlook scoring goals in almost every match and breaking records held by Real Madrid legends Alfredo Di Stéfano, Hugo Sánchez, Manuel Alday and Telmo Zarra. Cristiano Ronaldo biography shows that he also broke the La Liga record for the most goals scored by scoring 41 goals in a single season. He also broke his own record of 42 goals scored in all competitions at Manchester United when he scored 51 goals in all competitions for Real Madrid. He won many different awards and got recognition of being the worlds best footballer by many sport magazines.